Be the best soccer player you can be - the EASY way! Would you like to possess brilliant ball-handling skills? To dazzle with your footwork and shoot with precision? 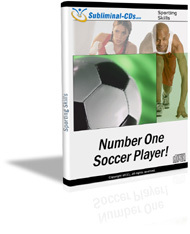 This powerful subliminal audio recording will quickly and easily unlock ALL your natural soccer playing skills and abilities! Using the latest in subliminal messaging technology, the Number One Soccer Player! session delivers thousands of positive, inspirational, life-enhancing messages directly to your subconscious ? allowing you to unleash the soccer superstar within! Don?t settle for substandard soccer skills! Purchase Number One Soccer Player! TODAY and enjoy these amazing benefits NOW! I am a soccer superstar! I am a soccer legend!